Kapha is a combination of the water and earth elements in Ayurveda. It’s the energy or substance that holds the body up: muscles, bones and tendons. We need Kapha and we all have it: it gives structure and stability to the body. 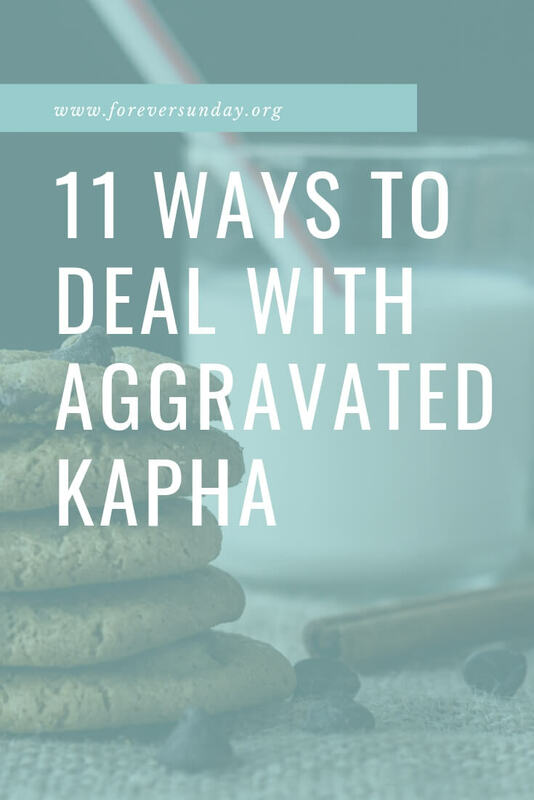 But what happens when we get too much Kapha and it is getting aggravated? A Kapha type person – or a Kapha dominant person – has a strong build with strong muscles. They have smooth skin which can be on the oily side. Kaphas often have curly hair – and a lot of it! A Kapha dominant person has large eyes with big eyelashes. They are hard workers and have excellent stamina and endurance. A Kapha mind is calm, grounded and stable. They are methodical. Real creatures of habit. Don’t mess with their routines! Kapha dominant people are tolerant and forgiving and full of love. Mind you, you don’t have to have all these characteristics to be a Kapha dominant person! We are all a different mix of the 3 doshas. The above is just a collection of typical Kapha properties. If you’d like to learn more about your ayurvedic type I recommend registering for my free 5 day mini-course! We are all a certain ayurvedic type or combination of types but we are also influenced by the seasons. Every season is governed by a different dosha. In winter Kapha energy has been accumulating in the body. In spring the energies of the earth change and the accumulated Kapha will aggravate. Alright, now what does that mean? Take note when these ‘symptoms’ are happening! But no excuses! :) In these days it is absolutely possible to eat tasty, comforting AND healthy food that makes you feel amazing too. None of these are any fun… So how do we balance Kapha? 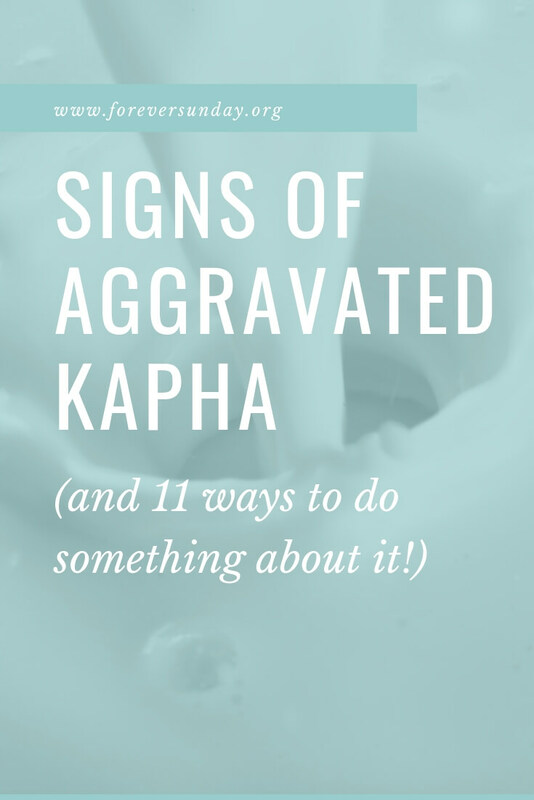 Do you recognise aggravated Kapha within yourself? There are some things you can do. 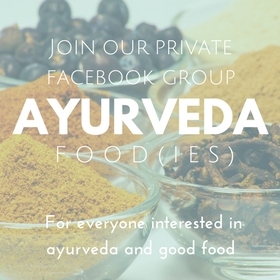 Ayurveda is all about taking your health into your own hands! * You can make changes to how you nourish yourself, adapt your lifestyle or use therapies that will balance Kapha. *While ayurveda has proven benefits and healing for chronic conditions, you need guidance of a vidya (ayurvedic doctor) and consult with your regular allopathic doctor before you change your medications. These foods are creating more Kapha in your body so it’s better to avoid them. Heat melts Kapha away so don’t be stingy with the spices! One of the issues with Kapha imbalance is water retention. Diuretic foods will help you get rid of some of that excess water. Keep yourself to 3 main meals per day, or even better – 2 main meals! Our digestion needs rest between meals and snacking just overloads the system. So no cookie with that coffee! You can try an ayurveda classic and go for a one day, 3 day or week long kitchari cleanse. Otherwise – the slightly more gentle approach – you can get started with intermittent fasting. Just skipping 1-2 meals per week is a lot easier to plan than a full on cleanse. Related: Intermittent fasting – what is it and why is it good for you? If you don’t have an exercise routine yet, take advantage of the longer days. 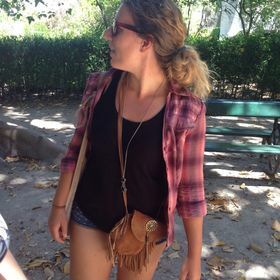 Simply going for a 10-15 minute walk after your meals will change the way food sits in your stomach and will fire up your agni (digestive fire). If you do already have an exercise routine, change it up! Go to a different class. Use a different fitness machine. Try a new tactic. Get out of your comfort zone! Kapha is such a creature of habit. Do something out of the ordinary every day! Gettin’ rid of some excess mucus, that’s all. Preferably before breakfast. If your nose feels dry afterwards, put some ghee or a drop of sesame oil in your nostrils. If you have a cold, you can do this multiple times a day. Make sure to use filtered water! Whether it’s a closet, your house, your office: tidy or clean something. In other words: get into action mode! Nasya and Vamana are two therapies in ayurveda that can help with aggravated Kapha. These therapies are part of an extended ayurvedic cleanse called the panchakarma cleanse. Nasya and Vamana are used to expel aggravated Kapha. Get it out of your system! Nasya is the administration of medicated oil through the nostrils. Not only does it clear nasal passages and sinuses – any medicine administered through the nose goes into the brain. Vamana is a therapy that involves induced vomiting (emesis). It is used to take excess Kapha out of the stomach. Both nasya and vamana are effective therapies to expel Kapha but you will need some prep and aftercare. Definitely clear some time in your schedule. Both these therapies ideally should be done under supervision of an experienced ayurvedic practitioner or doctor!